This particular sheet is one that I always liked seeing. It is an air force sheet that covers several different aircraft types. In my opinion, it is too bad that we don't see more like this as it always got me interested in building varying subjects. Anyway, this one is on the Israeli Air Force from the time when the F-15 had just entered service and the Phantom the main iron bomb lugger. For some of these aircraft, kits are made by several manufacturers; like the DH-89 (which is only done by Heller to my knowledge) will take a bit of searching. I only show one side of the instruction sheet on this one as the other planes are relatively well known, so let me start with them. There are markings for a 2 kill F-15A # 695. 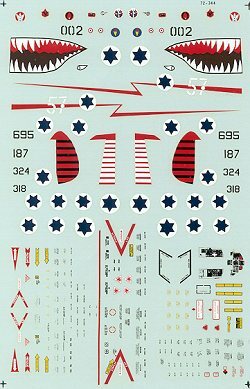 It is in the older colors of FS 36320 and 36375 in the standard 'Eagle' pattern. The other on the back side is the large shark-mouthed F-4E, # 187 in the FS 33531 tan, 34227 green, and 30219 brown over 35622 light blue. From all the reading I've done, there was only this one aircraft done with this gigantic shark mouth, but it is probably the most modeled Israeli F-4 ever done! In a similar color scheme are a pair of A-4Ns from 1975; # 318 and 324, the only difference being the unit badge. These both have red/white rudder stripes. The Dragon Rapide is in overall silver dope as was the norm for training and liaison aircraft. Finally, an overall black Spitfire VIII (though I suspect it is actually a Mk. 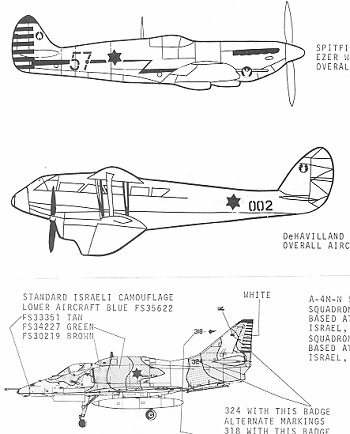 IX) as flown by Ezer Weizman with 101 Squadron. There are enough data markings and insignia for all the planes on the sheet so if you can find this one, it will do a goodly number of different IAF planes.